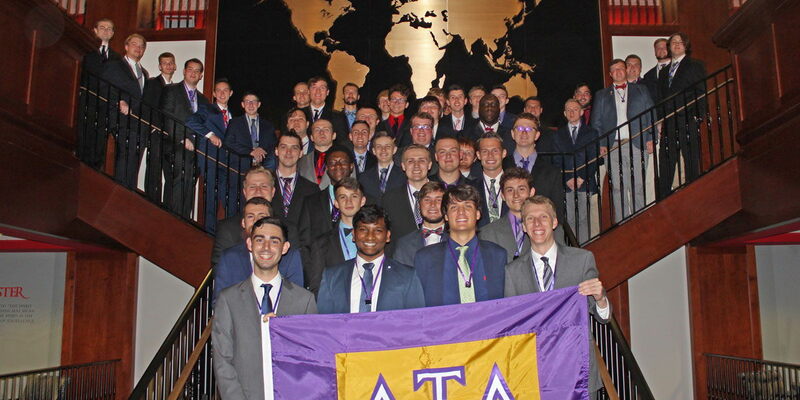 Delta Tau Delta welcomes a new colony of 57 men inducted into the Fraternity as new members of the Epsilon Xi Crescent Colony at Western Kentucky University. The men of Lambda Chapter at Vanderbilt University inducted these campus leaders during a ceremony performed at WKU’s Downing Student Union on October 5, 2018. “This expansion project at WKU was an ideal experience in which a core group of talented staff members, countless community stakeholders, more than 20 Epsilon Xi Chapter alumni and 57 remarkable young men came together to challenge the status quo and change the fraternity climate for the better. I could not be prouder of this group of men who have chosen to pursue a life of excellence,” said Ben Grothe (University of Iowa, 2017), senior leadership consultant. Grothe was one of four Central Office staff members who arrived on campus in September. The Fraternity’s expansion team also included Nick Yarbrough (Baker University, 2017), senior leadership consultant and Chapter Leadership Consultants Zack Day (University of Northern Colorado, 2018) and Cody Nulph (University of South Florida, 2018). Fraternity staff also recruited a volunteer advisory team led by Colony Advisor Donald “DG” Sherrill who will guide the new Delt members in their pursuit of a charter. Also working with the colony are Assistant Advisor for Ritual Education Lee Grace (Western Kentucky University, 1984), Assistant Advisor for Recruitment Andy Gregory (Western Kentucky University, 1993), Faculty Academic Advisor-Wren Mills, Assistant Advisor for Alumni Relations Mark Stivers (Western Kentucky University, 1990) and Division Vice President Derek “Chef” Olive (Western Kentucky University, 1991). The colony is poised to become an academic leader on campus with a 3.3 cumulative grade point average. And as part of a commitment to community service several colony members and the entire expansion team cleaned the Houchens Industries-L.T. Smith Football Stadium on Sept. 30. Doug Russell (Western Kentucky University, 2010), director of chapter services and Adam Abbott (Morehead State University, 2017), director of growth joined dozens of Delt alumni and community members who gathered for the colonization ceremony. Charley Pride, director of student activities at WKU and Andrew Rash, coordinator, Greek affairs also attended. Western Kentucky University boasts a mission of preparing more than 17,500 undergraduate students of all backgrounds to be productive, engaged, and socially responsible citizen leaders of a global society. Today, the University, founded in 1906, provides research, service and lifelong learning opportunities for its students, faculty, and other constituents enriching the quality of life for those within its reach. Western Kentucky’s Greek-letter community includes 34 organizations. Originally installed as the Epsilon Xi Chapter in 1967, Delta Tau Delta is now the 14th member of the Interfraternity Council on campus. Founded in 1858 at Bethany College, in Bethany, W.Va., Delta Tau Delta has 131 chapters and colonies in 39 states and the District of Columbia with a membership of more than 9,000 undergraduates and 123,000 living alumni. The Fraternity posts a GPA of 3.1, making it one of the highest achieving men’s fraternities academically.